Lunenburg, Nova Scotia, originally uploaded by Stephen Downes. On January 1, 2010, we drove to Lunenburg to take pictures. Instead, though, we got caught in a blizzard and didn't really get anything. So, on the last day of 2010, once again from Halifax, we set out to get some photos of Lunenburg. More successful this time - so much so, there wasn't even snow on the ground. Bonus. Here's the full set. After the Storm, originally uploaded by Stephen Downes. After the big nor-easter this week we went to the coast at Petit-Cap to see some of the damage. The entire beach has moved about 10 meters inland. That's our car in the photo, in what I think would be a really good Honda Civic advertisement. View the set. Somebody in #ds106 suggested custom Google pages. This is what my custom Google page has looked like for some months now. The photo is from my set of St. Andrew's, New Brunswick. Another post for #ds106, Raymond Chandler's The Long Good-bye. 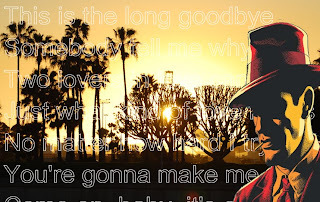 Photo of Long Beach, California, by me, graphic from here, and lyrics from Keating Ronan's 'The Long Goodbye' from here. Other people may be preparing for ds106 by creating their own animations from popular movies, but I find real life much more interesting. This sequence is of the lights changing over the river in downtown Medellin, Colombia, in 2007. Made by Picasion. Irving Nature Park, originally uploaded by Stephen Downes. Andrea and I walked around the Irving Nature Park on Taylor Island in the Bay of Fundy, just outside Saint John. Here's the rest of the set. I've made this blog specifically for Jim Groom's Digital Storytelling course, but I imagine I'll keep it around as a place to make art generally.